Welcome aboard. Good to see another tank being built. If you get it done in the next year I'll buy you the first beer at the Lake, good luck. Someone smarter than me will post a link to our new rule book which you can download for free. Its the bible. The basic tube dimensions and cage designs are there but the rest is totally up to you. There will be plenty of help available here so ask any question that comes to you. Work out a rev/diff ratio/wheel size equation and compute what sort of speeds you are looking at for what you believe are safe revs for your motor. Tyre choices are limited as you will be looking for tall narrow ones with a high speed rating, they aren't much in demand for anything other than what we are doing so it's Goodyear Landspeeds or nowt.That means unless you have a fat wallet you will have 28inch dia. tyres or less. The ratios for the VW transaxles are a bit limited aren't they? I'm not trying to discourage you but this game is a bit like a venn diagram...... you need to find the intersection of what you can afford, with what you want and hopefully the intersection will equal fast....it doesn't for everybody. I'm prepared to bet you an amount you can nominate that unless you have a morbidly obese wallet and some very skilled employees that you won't be done in a year and I mean that in the nicest possible way.This is expensive and although there are plenty of people who are willing to offer advice and opinions it won't necessarily make the job easier.....in fact what you will notice is that each time you learn more your expectations rise......as I see it they rise in direct proportion . When you start 150mph sounds fast enough.Once you've built the car 200 won't be enough, you may never get there but it will be a stone in your shoe....that you can't get out. I urge you to spend a year designing the body to be as good an aero shape as possible, you won't regret it. For starters I don't want to sound condescending .I posted the following on landracing.com as advice to another Aussie starting a build. It still rings true to me. I've got a couple of suggestions and they are by no means aimed at you personally.I'm going to put them down line by line because I'm not(for once ) up for an essay right now. It has been said many times here , everything has been thought of , lots of it done, some of it worked.....so find as much LSR history as you can...the good the bad and the ugly, the bold and the beautiful,look at 'em and read what they did.Some very clever people have been at this game, there have also been some mad ones and some very rich fools, learn from their experiences. If you're going to be true to what you wanted when you started you first have to finish.This can be horribly expensive, if you bite off too much you'll have a half finished thing that has sent you broke. This game is a battle between power and drag, you need to convince traction to be your friend. Power you can get at the shop,most people have more than enough.Drag is something your design will dictate and your design is prey to thousands of different factors.Keep it simple , have a reason for everything you do, not a hunch. The rules. There are very specific minimum requirements related to safety, learn them off by heart and begin your design there. They dictate the smallest possible area you can sit in. Learn the basics of aerodynamics, it's not likely you'll ever get to a wind tunnel so apply the knowns, the unknowns are bad science . There are a lot of records up for grabs in the DLRA, but you're not the only person building something........have a really good look at the Budfab motorcycle streamliner, something along those lines is conceivable, aiming for 300 is a serious step for a self confessed newbie. It is important to build what you want. The issue though is how informed you are, as I mentioned in the above post it seems the more you learn in this game the more you expect.....so, you're into VW's....I can see some problems with aircooling, landspeed and air cooling are uncomfortable bedfellows.The important thing though is do what you want to do because that will get you through the times when everybody thinks you've lost it and you're starting to think they're right. bike motor? thats an idea I could warm to, how small can you class a belly tank? EAN09 wrote: bike motor? thats an idea I could warm to, how small can you class a belly tank? There's one running in the club with a 500 smoker in it(IIRC)....you could do worse than a CBR600, any of the 1litre superbike motors, or a Hyabusa will put you in 200 territory. What you need to think about is whether you want to have a crack at 200 or whether you're going to fight in the welterweight classes(under 1 litre) where you can get away with cheaper tyres, lighter roll cage, less fire system etc, don't quote me on that. Get two rule books, one for the house and one for the can. When you can comfortably quote from memory any relevant rulesfor lakester class you are ready to start building, if you are building and you need to come back here asking questions about rules you haven't read enough......the only reason I say that is you will find "sweet spots" in the rules that better suit what you are trying to do. Get thee out to the shed. Its a GP Honda RS125 i think so no ordinary motor, and a bike so has a advantage of only 2 wheels but goes to show what can be done with good aeros. 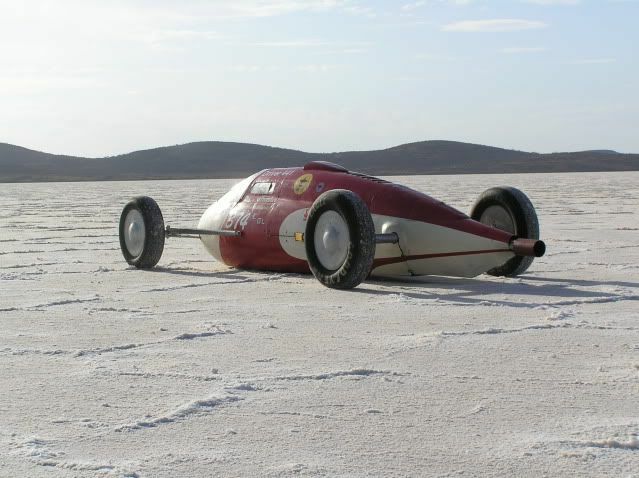 If I were to live long enough to complete all my other projects a bike motor streamliner would be on the list. Horsepower per cube per dollar spent the bikes win every time. Personally I think building a real belly tank is like building a ship in a bottle, should be attempted only if you are (or should be) commited. momec3 wrote: If I were to live long enough to complete all my other projects a bike motor streamliner would be on the list. Horsepower per cube per dollar spent the bikes win every time. Can't say I have any reasonable basis to disagree with that.